As I mentioned in my last post, E-Kol was planning to participate in Grandma’s Marathon in Duluth, MN. Tony and I made plans to go up there and fish/hang out with him before and after the marathon, seeing as there are several species up there that cannot be caught (or are extremely difficult to catch) down closer to the Twin Cities. I slogged through my half-day of work (it was torture, really. I am definitely taking the entire day off next year – it is actually impossible to concentrate on a Friday morning, at home, while anticipating a weekend full of camping and fishing. Tony came to pick me up at noon, and we were on our way. It was about a 3 hour drive to our first fishing destination, where Eric would meet us. I spent half of the drive listening to the Dead Kennedys and Tom Waite (educational experience for me, though I knew ONE Dead Kennedys song from Guitar Hero 3), and the other half of the drive accidentally falling asleep. I was, after all, running on 3ish hours of sleep, and I wasn’t driving. Thankfully, Tony told me that I hadn’t snored much (though he reassured me that it wouldn’t have bothered him if I had). As we were driving through Duluth, we saw a truly horrifying sight. We came up behind a traffic slowdown, and were shocked to see that a boat had somehow been moved off of its trailer and UP ON TOP OF THE BED OF THE TRUCK THAT WAS HAULING IT. Later in the trip, during periods of extreme downtime, Tony and I would discuss the impossibility of the occurrence. We stopped briefly on our way up to fish a new river – it looked like it might hold Lake Sturgeon. I got pecked off once, but we were only there for 30 or so minutes, so we left without incident or fish. At long last, we arrived at the spot. Incredibly enough, Eric (who had also been fishing his way up) arrived at EXACTLY the same moment as us. It was crazy. We all got rigged up (target: White Perch) with two rods (legal on border waters such as this one). 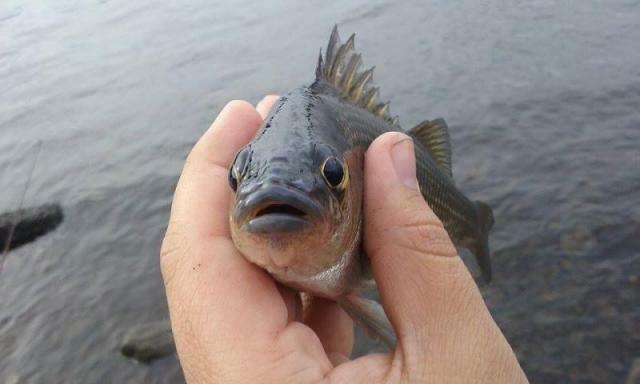 They are also not perch at all, but a species of temperate bass (a la white bass, striped bass, and yellow bass). I set up a ‘long’ rod out towards the middle of the river and began using my 10-foot fixed-line cane pole to bounce around a small hook with a nub of crawler in the weeds in the shallows. Within 45 seconds of doing that, something large (it looked sucker-like) grabbed my bait, took off with it, and snapped my line. Tony (the undisputed fixed-line master) informed me that my leader had been too short – the fish hadn’t been allowed to put as much bend in the rod as necessary. E-Kol gave me some replacement 4 lb test, and I made the leader as long as my rod so that I wouldn’t lose the next medium+ sized fish that bit on that rod. After 20 or so minutes, I got another bite, and brought a small Northern Pike to shore before letting it shake itself off. 10 minutes later, Tony caught his White Perch, as well as a Ruffe (a small, invasive European fish that also came to the Great Lakes region via boat ballast). I was a bit jealous of the Ruffe, but Tony and Eric assured me that they were not difficult to catch in this spot, even on normal-sized hooks. Before too long (15? 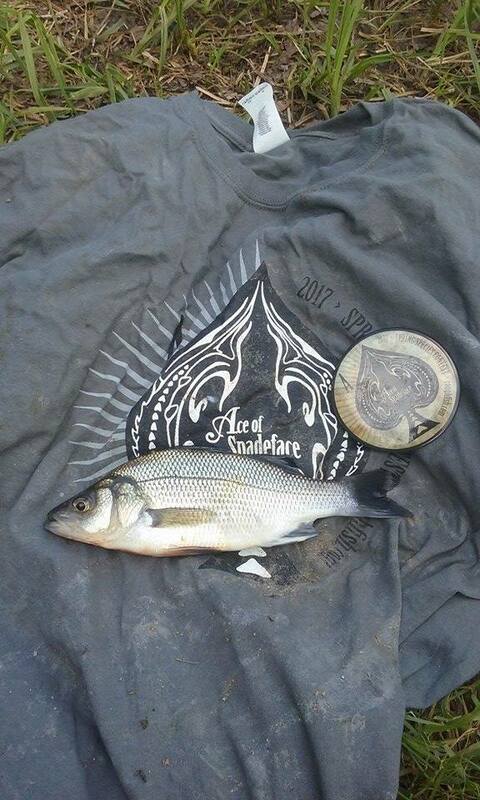 minutes), I got a hard hit on my far rod, and brought in my Contest White Perch. After much coaxing, and a couple more fish for Tony, Eric finally caught his White Perch, and we packed up and BS’d for a while around the cars. It was then that I noticed that both Eric and Tony were wearing official Roughfish.com hats, and I had no such headgear. I’ll have to buy myself one of those if I’m ever going to be as cool as them, or as good a fisherman. Eric left to register for the marathon, and Tony and I drove to our next destination, where we would target Longnose Suckers (one of the primary targets of the weekend). But first, we had to make another Subway stop. I like Subway. I eat it almost every time I’m out fishing. When Wells Fargo gives me a $50 gift card for being a good employee, I use it for Subway. It’s my treat. I eat a lot of Subway. We got to our spot, paid for a year-long park pass for Tony’s station wagon, and got set up. Despite looking absolutely gorgeous and fishy, we didn’t get any bites before E-Kol showed up. After a little deliberating, we decided to try upstream, just down from the waterfall. Stupid me – I didn’t think to take a picture of the waterfall, so you’re just going to have to take my word for it. After taking an unnecessarily dangerous route down to the water (one should always look around for alternate routes before doing as E-Kol does), we all set up in different places. Eric perched himself atop a slippery-looking cliff (as E-Kol is wont to do), Tony waded out to a rock where he could use his super-long cane pole (as Tony is wont to do), and I was boring and set up on the safe shoreline. Tony on his chosen rock. Tony had explained to me on the way up that we would try this river first, but it might be too late in the month (June 16) for the Longnose to be in the river spawning. If so, we would have to work our way further North in search of fishable numbers of them. Not much happened for a while – at least an hour and a half. Tony hooked and lost a sucker-like fish and broke off a few times, and I fiddled around near shore and BS’d with Eric (he’s one of my favorites – a really sincere dude). It was starting to get dark by the time I got a convincing bite. I lifted the rod, felt the fish, and fought it in with bated breath. Eric easily grabbed it close to shore, and I had my third lifelist fish of the contest. After a not-so-quick photo session, I released the straggler to fight another day. We continued to fish into darkness in the hopes that Eric or Tony would get one as well, but it wasn’t to be. We piled into our cars, said adieu-for-now, and went our separate ways. Tony and I went to a harbor town with plans to fish at dawn for Lake Trout and Coho Salmon. We got to the town, and drove around searching for a spot to camp out. We opted to sleep in/near a public park. Tony decided to sleep in the woods, while I decided to clear space in the back of his station-wagon and get some sleep. I slept fitfully until about 4:30, when Tony woke me up for the morning’s fishing. Life goal: Sleep in a car on the side of the road – check.